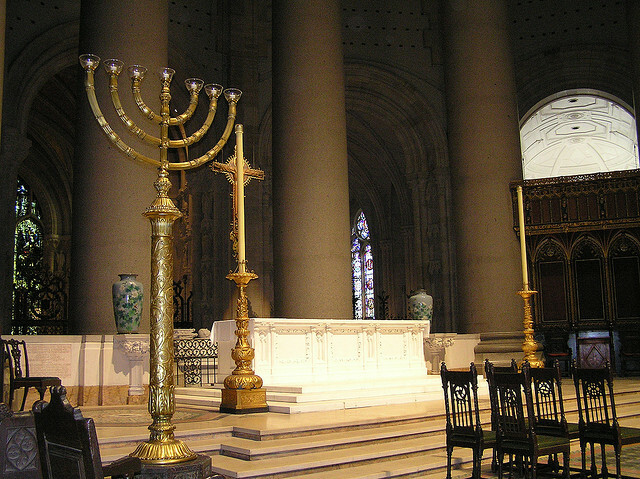 The menorahs on the altar of Episcopalian cathedral St. John the Divne Cathedral, NYC. Photo of the day: WHEN HOLIDAYS COLLIDE, HAPPY THANKSGIVING & HANUKKAH – This is the altar of the Episcopal church, St. John the Divine in Harlem. It contains a cross, a chalice for communion, the holy bible and two giant menorahs. Not your ordinary “Christian” altar? You’re right. St. John the Divine, since it was built in 1892 has always believed that all religions should be welcomed there, after all – isn’t that the ‘Christian’ thing to do? Don’t we all believe in a “god”? Don’t we all try to lead a ‘god fearing’ life? In 1930 Aldof Ochs, the founder of the esteemed New York Times newspaper was so impressed and taken by the idea of St. John’s open arms, he donated two 11.5 feet tall golden menorahs to the church. They grace their altar and welcome all faiths as they and we celebrate Thanksgiving and Hanukkah on the same day. The last time it happened was 1888 and the next is 79,043 years from now – by one estimate widely shared in Jewish circles. Welcome all to the table, after all . . .
isn’t that the Christian thing to do? This entry was posted on November 27, 2013 by newyorkcityinthewitofaneye. It was filed under DAILY PHOTOS WITH STORIES OF NEW YORK CITY and was tagged with 'the Christian thing to do', 1888, 1930, 79043 years from now, Aldof Ochs, architecture, Episcopal cathedral, golden menorahs, Hans Von Rittern, HANUKKAH, HAPPY THANKSGIVING, Harlem, Holidays in New York City, Manhattan, menorahs on episcopalian altar, mix of Jewish and Episcopalian religions, New York City, New York photo, Photo of the day, St. John the Divine, Thanksgiving and Hanukkah, Thanksgivukkah, The New York Times.